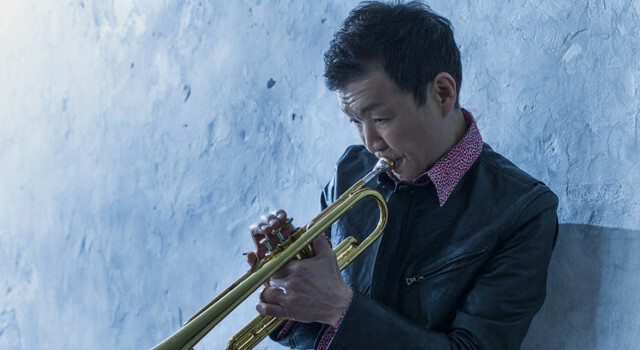 All that is unusual and unexpected about Shunzo Ohno is encapsulated in the glimmering, intimate and transcendent howl of his trumpet. He plays each note that flies out of the bell of his instrument as if he were creating the pristine and pure image of crystal. There is a spritely lilt to his playing that it feels more like a downbeat. But the fact is that Mr Ohno’s playing is so clean, clear and precise (and contained within the flare of the trumpet’s bell) and the thought behind everything he plays is so unassailable that to listen to him is to feel safe with music that is often manhandled, even if it challenging to one’s perception of it. Shunzo Ohno does pull many phrases around to a risky degree but it never feels like the egomania of other performances (partly because of the shimmering glissandos in his glorious technique and this is often an enormous relief. Some of his playing – especially in an ensemble situation – has a chamber performance quality. It is here that the intimacy of his sound reaches the highest degree of perfection. There is not only a strong sense of dance behind all that he plays even in the slower examples of his playing whose speeds he chooses to pull up even further than most, but of pulse: the forward motion of everything he plays is driven by continual metronomic tick that, although inaudible, is constantly transferred from Mr Ohno to the listener. The trumpeter shot to prominence when he was given an opportunity to play in Art Blakey’s Jazz Messengers in 1975, in a group that included Nelson Santiago on alto saxophone, David Schnitter on tenor saxophone, Kasal Allah on piano and Yoshio Suzuki on bass. In the 1980’s Shunzo Ohno made three world tours with Machito. He also made records, one of which went on to win a Grammy Award in the Latin category in 1984 forMachito and his Salsa Big Band. In 1988, Mr Ohno garnered his second Grammy for Live at the Sweet Basil with the Gil Evans ensemble, with whom he was playing at that time. That year Shunzo Ohno suffered the first major setback to his career after he became involved in a serious motor car accident. Recovering from crippling injuries he went on to play in many acclaimed bands, leading and recording in many of his own albums as leader. Cancer took hold of his tonsils and this new setback forced him to focus on his health once again. His entire playing technique changes after this this, but his sound continued to be as unique as ever when he returned a decade later. His remarkable life story continued with busy travel and performance schedules both in groups he led as well as in the bands of other musicians including that of Larry Coryell, Buster Williams and others. Shunzo Ohno’s life became the subject of Shunzo Ohno: Never Defeated, produced by Sean Gallagher of WhatNot .In 2014, The documentary film which features narration from the legendary bassist Buster Williams, was be premiered in June 2015 at The Cutting Room and followed by a live concert featuring pianist David Berkman, drummer Jerome Jennings, bassist Ed Howard and guitarist Paul Bollenback. Over recent years, Shunzo Ohno has been touring the globe, performing frequently in Hong Kong, Malaysia, China, Singapore, Taiwan, and Japan. He has been an avid supporter of the recovery efforts following the natural disasters in Japan and recently, Nepal. Shunzo is thrilled to return to the United States for this exciting tour. He will continue his United States tour with performances at The Bean Runner on June 27 in Peekskill New York and Jazz Forum Arts at Lyndhurst in Dobbs Ferry, New York. Shunzo Ohno also won the International Songwriting Competition’s grand prize with this composition “Musashi”, making Shunzo the first jazz recipient of this prestigious award. Raul Da Gama: What have you been up to musically speaking in the last two years, say? Shunzo Ohno: Recently, I recorded a cd, ReNew. (Late Fall 2015, release date in April 2016)) My original experience with jazz was spontaneous collaboration, involving listening and responding; adding colors, or simple silence…In these times, there is a tendency towards one voice. I prefer the collaborative experience. Although I may be the composer who is ultimately responsible for the recording, I prefer to allow each artist to contribute their voice within the context of the outlined composition. Instead of dictating, I enjoy the free process. This is sometimes risky, but I like that aspect. I honestly trust the friends on this cd and on concert tours. I have been touring in Asia; Japan, Malaysia, Hong Kong and some US cities. Visiting Northern Japan where people are still in the recovery process today (2015). Heightens my awareness. Most of us in the US have already forgotten this historic event. Paying attention to the human experience has become important to my music. I have dedicated the last two CDs to Northern Japan, but in many ways to all people who are in their own personal process to recovery. SO: Thank you for this question. It makes me think back to when I was young living in Gifu in the 1950’s. Japan was in reconstruction from the war. Most people were heart broken and doing their best to rebuild their lives. No one had material things to give them pleasure or relief. Music for me became the gift of hope. Sounds so corny but the truth of the matter in those times remains the same as it does today. Songs of love, of beauty and hope, instill that spirit directly to our immediate environment. It was a vehicle to express joy even if there was little joy around our family and neighbourhood. As a teen I was playing with Tokyo Jazz Big Bands. Musicians were in a sense part of a “team”. We each had a responsibility and united it created a sound that people instantly reacted. We all became part of the creative course, which I truly enjoyed. RDG: How much does the culture of Japan play in the music that you make – I mean, what role does Shinto, (if you practice it) play in jazz… Your good friend, Wayne Shorter is Buddhist and it does colour his music… Is this something important to you when you write and play? SO: In the last 10 years, I have been paying more attention to the critical role folk songs play within our heritage and future. Every country has folk songs and lullabies that connect us to our roots of humanity. I recorded Poetry of Japan, with all folk songs. With the last 2 recordings, dedicated to Northern Japan, I have included my arrangements of Tairyo Bushi, and Okinawa, It has become songs every audience recognizes. Now international audiences identify with these roots and the global determination of recovery. Eventually, I would like to record folk music from all over the world. There is a heart in folk music that has no boundaries. Interestingly, these jazz renditions have resonated with 3 generations. Regarding your question about Wayne Shorter and Buddhism: Wayne Shorter (sax), Herbie Hancock (piano), Buster Williams (bass) and I are members of SGI (Soka Gakkai International). Our Buddhist beliefs encourage the promotion of developing one’s unlimited creativity, compassion for the dignity of life and a collective global peace. This is accomplished by the development of self-realization as we contribute to the harmony of our environment. Each of us is uniquely different with a vast potential of great good with each challenge we face. So I see each of my personal mountains as an opportunity to dig deep and reveal my best self. RDG: You have been grievously ill not too long ago and your recovery has been remarkable. Clearly music – you love and passion for it – has played an important role here? Can you take me back to when you felt it and how you approached music before your illness, during your illness and now…? SO: Yes, I think even before I had the car accident and faced cancer, I faced homelessness and a great void of self-confidence. After a year or so in NYC, I lost my sense of identity. I was caught up in the fast pace of nightlife. Regaining the value of my life was the first battle. With the car accident I suffered a concussion, broken teeth and split lips, which is devastating for a trumpeter since all my abilities to produce sound came from my lips (embouchure). To this day, I have a scar tissue blockage with my lips and it took me a long time to discover a way to make a sound. Then a few years after, I was diagnosed with 4th stage throat cancer. Of course the throat is another part of the body necessary to play the trumpet. This required a long time to create a sound on the trumpet. The many doubts the physical pain, and the seemingly endless inability to simply sit up or stand, or walk was a confrontation with my identity. More than being able to play music, my life was threatened. But I always equated my music and my life as one. The desire to live was certainly tied to a sense of purpose within my music. I have come to understand what makes my life strong, makes my music sing, and identify with infinite human conditions. There were professionals in the medical and music fields that believed it was not possible to play trumpet again. That is understandable given all the facts. But the spirit of determination is powerful. It became my mission to live to play music with people who experience ‘no hope’ and important to me to find hope not just for myself. One can’t play or write music that doesn’t exist in their own heart. I have so much appreciation for the full experience. RDG: Now please feel free to say anything about what your life means to you in relation to your music and your family and other relationships. SO: My wife, Kazuko and I have been together since 1976. We have gone through very dark times and even greater triumphs. Her partnership, support and imagination always have significant effect on my life. Our 3 daughters, Maya, Sasha and Lea have taught me various life lessons which I am so very grateful. Being a member of a family entails a responsibility to become a better person on the deepest level.